I have been way too busy the last few days to do anything fiber-ish. Â Between straightening out last-minute snafus with loan documents for our house, and going to a full-day class on project management while staying on top of things at work, it’s been a busy time. Â Today is going to be just as busy, but I managed to carve out one precious hour to play with fiber stuff – if I don’t get to create for more than a few days I start getting really cranky, so I make time for it even if I’m totally behind on everything else. So here is the result of one precious hour: a new skirt prototype. 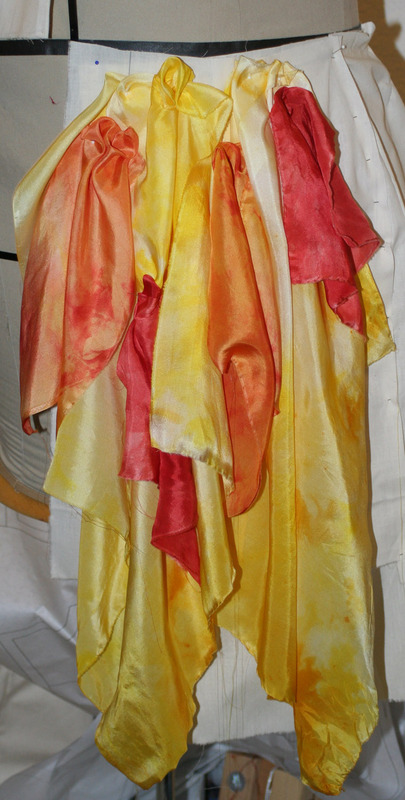 This is constructed from squares of china silk, folded over at the corner and then gathered and hung on the bias, with bias-cut strips of silk organza and china silk dangling down in random places. While this is undeniably rough, I like the idea and will be developing it further. Â I also plan to develop another version of the “thin strips” approach you saw in prototype #1, but I like this one for a couple of reasons. Â First, it uses bigger pieces of fabric. Â This will allow people to see the pattern I am weaving into the cloth – with thin strips there isn’t much reason to weave pattern into the cloth because you don’t see enough fabric in any one piece. 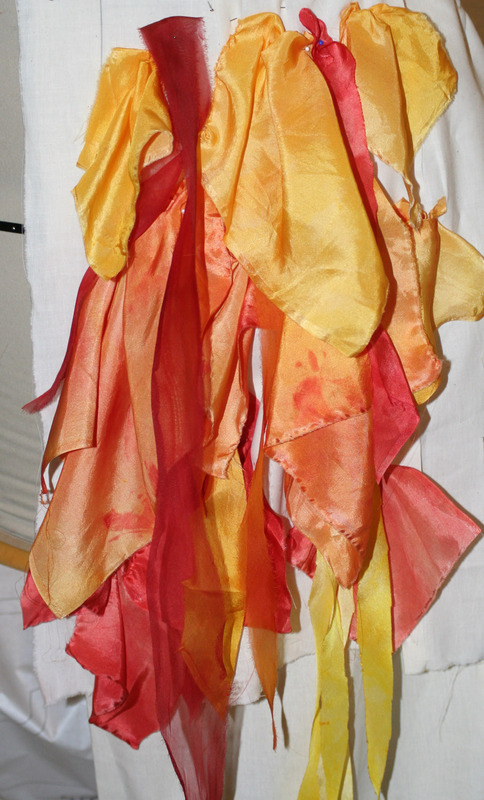 Â Second, it offers more variety in the shape of the rags, which I think adds visual interest. In this one, large yellow squares are put on, then smaller squares of varying colors are attached in random spots. Â I didn’t like it for two reasons. Â First, it doesn’t make visual sense, since the squares are put on at random so there is no sense to the colors. Â Second, it’s bulky at the top, since there are more layers of fabric there. Didn’t like this either. Â While it’s not too bulky, it’s way too orderly, and not enough variety. Â Boring. I like this. 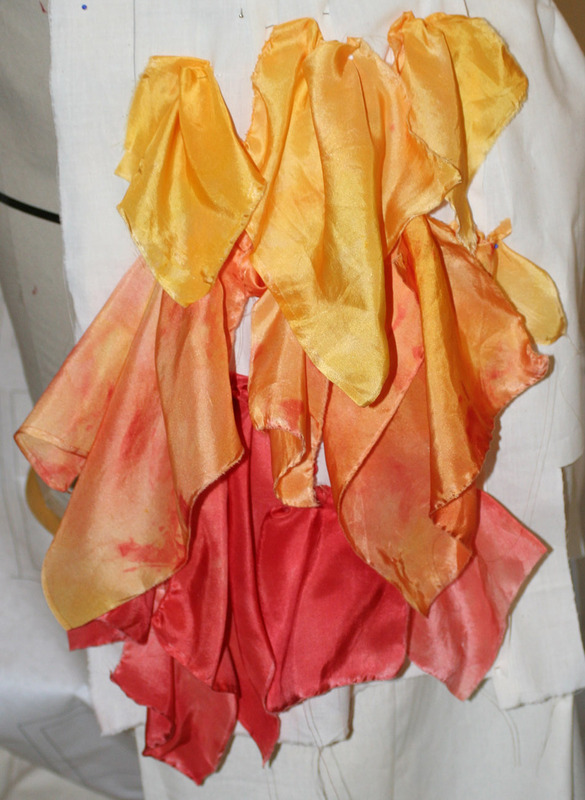 Â There is an underlying color progression (predominantly red at bottom to predominantly yellow at top), which saves the piece from total chaos, but the bias-cut ribbons break it up a bit and add variety, and also unite the layers of the skirt by providing the eye a vertical route from top to bottom. Â The organza also adds some textural variety. I found it interesting how much visual impact those few bias-cut strips made! Â There’s a huge visual difference between second and final versions, and it’s all because of a few ribbons. Â Fascinating. Okay, my hour’s up. Â Back to work!